One of the most misused verses in the Bible is, “Judge not, that you be not judged” (Matthew 7:1). Every Scripture verse should be read in its context, if we are to properly understand its true meaning. In verses 2-5 of this same chapter it is evident that verse 1 is referring to hypocritical judgment. A brother who has a beam in his own eye should not be judging the brother who may have a speck in his eye. The lesson is plain; you cannot judge another for his sin unless you have confessed and forsaken that sin. Those who cling to “Judge not, that you be not judged,” to condemn those who expose error should read the entire chapter. Jesus said, “Beware of false prophets, who come to you in sheep’s clothing, but inwardly they are ravenous wolves. 16 You will know them by their fruits” (v.15-16). How can we know false prophets unless we judge them by the Word of God? Did the Lord mean that we are not to judge them by their way of life and their doctrine? Certainly not, because you cannot know without judging, i.e. checking them out by what the Bible teaches. To further the point, Jesus tells us: “Stop judging by mere appearances, but instead judge correctly” (John 7:24). Here our Lord commands that we are to judge based upon the Word of God. If judgment is made upon any other basis, other than the Word of God, it is a violation of Matthew 7:1. 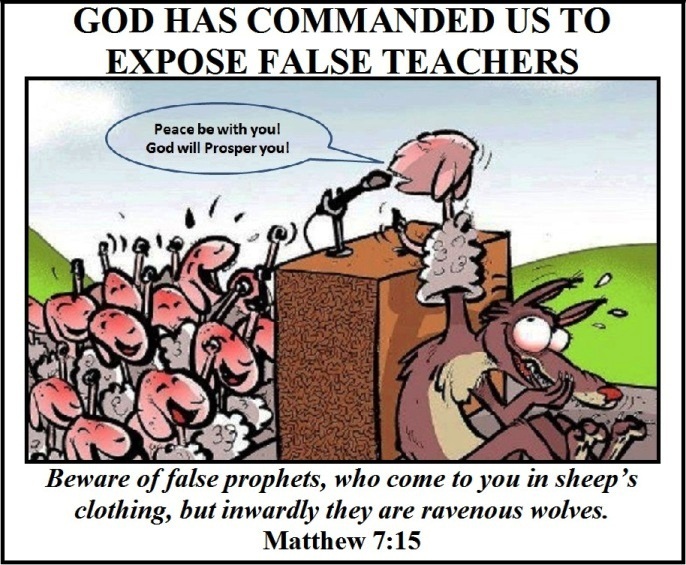 When we allow false teachers to freely spread their poisonous doctrines, because Christians do not have the courage to expose them as Jesus and Paul did; wolves in sheep’s clothing are thus enabled to ravage the flock, thereby destroying many and sending them to eternal damnation. Jesus said to the religious Pharisees, “You brood of vipers, how can you who are evil say anything good? For the mouth speaks what the heart is full of” (Matthew 12:34). To many evangelicals and some fundamentalists, this would be unacceptable language today, it would be to unloving, and unkind, but these words comes straight from the mouth of the Son of God. The most loving thing that we can ever do is tell people the truth – and you shall know the truth and the truth will set you free (John 8:32). Our Lord further called them “hypocrites…blind guides…white sepulchers…serpents…and you generation of vipers” (Matthew 23:23-34). Yet, we are told today that we are to fellowship with men whose doctrines are just as unscriptural as those of the Pharisees. Some say that these kinds of people are Bible believing Christians and insist on working with these heretics. And, according to many, we are not supposed to rebuke them for compromising the Word of God. Remember the Pharisees believed in God and were supposed to be the most religious group of all and Jesus rebuked them sternly. The Bible tells us that we are to test them. “Beloved, do not believe every spirit, but test the spirits, whether they are of God; because many false prophets have gone out into the world” (1 John 4:1). Everyone that calls themselves a Christian needs to be tried against the Word of God. We are to watch out for them and avoid them. “I urge you, brothers and sisters, to watch out for those who cause divisions and put obstacles in your way that are contrary to the teaching you have learned. Keep away from them” (Romans 16:17). Those whose conduct and teaching contradicts the Word of God we are to watch out for and strictly avoid. We should have nothing to do with them. “Have nothing to do with the fruitless deeds of darkness, but rather expose them” (Ephesians 5:11). We are commanded to have nothing to do with these false teachers, prophets, apostles, etc., but we are to expose them. We should not be quiet, but follow Paul’s warning to Titus, you must hold firmly to the trustworthy message as it has been taught, so that he can encourage others by sound doctrine and refute those who oppose it. (Titus 1:9). How can we obey Scripture unless we expose false teachers by the Word of God? We are not to receive them into our house. “If anyone comes to you and does not bring this doctrine, do not receive him into your house nor greet him; 11 for he who greets him shares in his evil deeds.“ (2 John 1:10-11). John is speaking about those who run ahead and do not continue in the teaching of Christ. We need to remember that false doctrines are not only brought to us by false ministers, but also by those that come by knocking on our doors teaching a false gospel, via radio, TV, music and literature. People that are uninformed let these false teachers into their home unbeknown of the danger that lies ahead. We are to look out for those who preach another gospel. Paul warned about those who preached “another Jesus … another spirit … or another gospel” (2 Corinthians 11:4). How can we know them unless we judge their Jesus, their spirit, and their gospel by the Word of God? Paul called such preachers “false apostles, deceitful workers, masquerading as apostles of Christ” (2 Corinthians 11:13). He explains in v. 14-15 that these preachers are the ministers of Satan and that their end will be what their actions deserve. We are to separate from them. “Therefore, come out from them and be separate, says the Lord. Touch no unclean thing, and I will receive you” (2 Corinthians 6:17). This makes it very plain; God’s people are to come out of apostasy and religious error. Many mistakenly believe that it is wrong to expose error and to name the guilty teachers; but as we have so far seen, the Bible teaches otherwise. Paul named Peter publicly. Peter was guilty of unscriptural practice. “As a result, other Jewish believers followed Peter’s hypocrisy, and even Barnabas was led astray by their hypocrisy” (Galatians 2:13). When the integrity and purity of the gospel is at stake, then we, as true Christians, have no choice other then to expose the error and name the guilty party. Paul named Demas for loving the world. “For Demas, because he loved this world, has deserted me and has gone to Thessalonica“ (2 Timothy 4:10). Those who forsake the cause of Christ for worldly living and pleasures should be named and exposed. Paul named Hymenaeus and Philetus. He told Timothy to “do your best to present yourself to God as one approved, a worker who does not need to be ashamed and who correctly handles the word of truth. 16 Avoid godless chatter, because those who indulge in it will become more and more ungodly. 17 Their teaching will spread like gangrene. Among them are Hymenaeus and Philetus, 18 who have departed from the truth. They say that the resurrection has already taken place, and they destroy the faith of some” (2 Timothy 2:15-18). False doctrine overthrows the faith of some, so those who are proclaiming it must be exposed; otherwise their lies will spread like gangrene. As we read in the Old Testament Nathan also identified and exposed the king. There was a man in a very high place who was a secret adulterer. Surely this man who held the highest office in the land could not be rebuked by a lowly unpopular prophet. However, Nathan went right into the presence of David, revealed the sin in a parable form, and then told the infuriated David, “Thou art the man” (2 Samuel 12:7). There are many other examples in the Bible about exposing false prophets, too numerous to contain in this short writing. The biblical point is that, likewise, we need to be ready and willing to name those individuals, churches, schools, and other organizations that are denying biblical inerrant authority, compromising the doctrine of God’s creation, requiring humanistic works for salvation, or bringing in other heretical doctrines. We obviously need to be sure of our facts when we do this and also to bring such charges only if motivated by genuine concern for those apt to be led astray if we don’t speak out. We had better beware of “false teachers … who will secretly bring in destructive heresies” (2 Peter 2:1). Faithful messengers will warn the sheep of these heretics, and identify them by name. It is not enough to broadly hint of their identity, for the young lambs will not understand and will be destroyed by these wolves if we do not have the courage to expose them.